The broadest definition of thermal pollution is the degradation of water quality by any process that changes ambient water temperature. Thermal pollution is usually associated with increases of water temperatures in a stream, lake, or ocean due to the discharge of heated water from industrial processes, such as the generation of electricity. Increases in ambient water temperature also occur in streams where shading vegetation along the banks is removed or where sediments have made the water more turbid . Both of these effects allow more energy from the sun to be absorbed by the water and thereby increase its temperature. There are also situations in which the effects of colder-than-normal water temperatures may be observed. For example, the discharge of cold bottom water from deep-water reservoirs behind large dams has changed the downstream biological communities in systems such as the Colorado River. The production of energy from a fuel source can be direct, such as the burning of wood in a fireplace to create heat, or by the conversion of heat energy into mechanical energy by the use of a heat engine. Examples of heat engines include steam engines, turbines , and internal combustion engines. Heat engines work on the principal of heating and pressuring a fluid, the performance of mechanical work, and the rejection of unused or waste heat to a sink . Heat engines can only convert 30 to 40 percent of the available input energy in the fuel source into mechanical energy, and the highest efficiencies are obtained when the input temperature is as high as possible and the sink temperature is as low as possible. Water is a very efficient and economical sink for heat engines and it is commonly used in electrical generating stations. The waste heat from electrical generating stations is transferred to cooling water obtained from local water bodies such as a river, lake, or ocean. Large amounts of water are used to keep the sink temperature as low as possible to maintain a high thermal efficiency. The San Onofre Nuclear Generating Station between Los Angeles and San Diego, California, for example, has two main reactors that have a total operating capacity of 2,200 megawatts (MW). These reactors circulate a total of 2,400 million gallons per day (MGD) of ocean water at a flow rate of 830,000 gallons per minute for each unit. The cooling water enters the station from two intake structures located 3,000 feet offshore in water 32 feet deep. The water is heated to approximately 19°F above ambient as it flows through the condensers and is discharged back into the ocean through a series of diffuser -type discharges that have a series of sixty-three exit pipes spread over a distance of 2,450 feet. The discharge water is rapidly mixed with ambient seawater by the diffusers and the average rise in temperature after mixing is less than 2°F. Image courtesy NASA/GSFC/MITI/ERSDAC/JAROS, and U.S./Japan Aster Science Team. Reproduced by permission. The primary effects of thermal pollution are direct thermal shock , changes in dissolved oxygen, and the redistribution of organisms in the local community. Because water can absorb thermal energy with only small changes in temperature, most aquatic organisms have developed enzyme systems that operate in only narrow ranges of temperature. These stenothermic organisms can be killed by sudden temperature changes that are beyond the tolerance limits of their metabolic systems. The cooling water discharges of power plants are designed to minimize heat effects on local fish communities. However, periodic heat treatments used to keep the cooling system clear of fouling organisms that clog the intake pipes can cause fish mortality. A heat treatment reverses the flow and increases the temperature of the discharge to kill the mussels and other fouling organisms in the intake pipes. Southern California Edison had developed a "fish-chase" procedure in which the water temperature of the heat treatment is increased gradually, instead of rapidly, to drive fish away from the intake pipes before the temperature reaches lethal levels. The fish chase procedure has significantly reduced fish kills related to heat treatments. Small chronic changes in temperature can also adversely affect the reproductive systems of these organisms and also make them more susceptible to disease. Cold water contains more oxygen than hot water so increases in temperature also decrease the oxygen-carrying capacity of water. In addition, raising the water temperature increases the decomposition rate of organic matter in water, which also depletes dissolved oxygen. These decreases in the oxygen content of the water occur at the same time that the metabolic rates of the aquatic organisms, which are dependent on a sufficient oxygen supply, are rising because of the increasing temperature. The composition and diversity of communities in the vicinity of cooling water discharges from power plants can be adversely affected by the direct mortality of organisms or movement of organisms away from unfavorable temperature or oxygen environments. A nuclear power-generating station on Nanwan Bay in Taiwan caused bleaching of corals in the vicinity of the discharge channel when the plant first began operation in 1988. Studies of the coral Acropora grandis in 1988 showed that the coral was bleached within two days of exposure to temperatures of 91.4°F. In 1990 samples of coral taken from the same area did not start bleaching until six days after exposure to the same temperature. It appears that the thermotolerance of these corals was enhanced by the production of heat-shock proteins that help to protect many organisms from potentially damaging changes in temperature. The populations of some species can also be enhanced by the presence of cooling water discharges. The only large population of sea turtles in California, for example, is found in the southern portion of San Diego Bay near the discharge of an electrical generating station. The dilution of cooling water discharges can be effectively accomplished by various types of diffuser systems in large bodies of water such as lakes or the ocean. The only thermal effects seen at the San Onofre nuclear generating station are the direct mortality of planktonic organisms during the twenty-five-minute transit through the cooling water system. 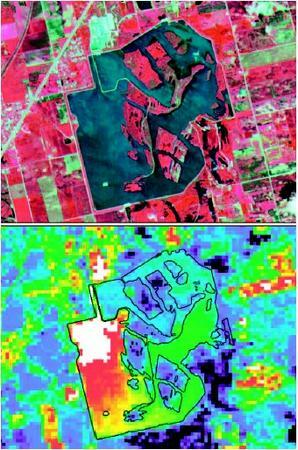 The effectiveness of the dilution systems can be monitored by thermal infrared imaging using either satellite or airborne imaging systems. The use of cooling towers has been effective for generating stations located on smaller rivers and streams that do not have the capacity to absorb the waste heat from the cooling water effluent . The cooling towers operate by means of a recirculating cascade of water inside a tower, with a large column of upwardly rising air that carries the heat to the atmosphere through evaporative cooling. Cooling towers have been used extensively at nuclear generating stations in both the United States and France. The disadvantages of cooling towers are the potential for local changes in meteorological conditions due to large amounts of warm air entering the atmosphere and the visual impact of the large towers. Brown, Richard D.; Ouellette, Robert P.; and Chermisinoff, Paul N. (1983). Pollution Control at Electric Power Stations: Comparisons for U.S. and Europe. Boston: Butterworth-Heinemann. Henry, J. Glenn, and Heinke, Gary W. (1996). Environmental Science and Engineering. Upper Saddle River, NJ: Prentice-Hall. Hinrichs, Roger A., and Kleinbach, Merlin. (2001). Energy: Its Use and the Environment, 3rd edition. Monterey, CA: Brooks/Cole Publishing Company. Langford, Terry E. (1990). Ecological Effects of Thermal Discharges. New York: Elsevier Applied Science. Larminie, James, and Dicks, Andrew. (2000). Fuel Cell Systems Explained. New York: John Wiley & Sons. Liu, Paul Ih-fei. (1997). Introduction to Energy and the Environment. New York: John Wiley & Sons. Ristinen, Robert A., and Kraushaar, Jack J. (1998). Energy and the Environment. New York: John Wiley & Sons. Slovic, Paul. (2000). The Perception of Risk. London: Earthscan Publications Ltd.
California Energy Commission. "Energy-Related Environmental Research." Available from http://www.energy.ca.gov/pier/energy/energy_aquatic.html . Thermal pollution from power plants in Florida turned out to be a lifesaver for the state's threatened manatee population. The ecology changed when irrigation wells and diversion channels that support Florida's agricultural development severely impacted the natural springs that moderate river-water temperatures. Manatees cannot survive in cold water and naturalists feared that irregular cold snaps would put the sea mammals at risk. Manatees, however. discovered the power-plant discharge zones and today, naturalists take advantage of cold weather to tally manatee population as the herds gather at local power plants. how does thermal pollution occur,and how can it be solved? i really got alot of information from this, but what would also be good is to find out the comparison of specific heat of water to other solvents, AND the importance of waters high specific heat to aquatic organisms. How does Thermal pollution affect the flow pattern of a river ?